On 22 May 2015, two young Tibetans were detained without a charge by Chinese authorities and taken into custody. Local Tibetans suspect that they were arrested for sending writings and photos of the Dalai Lama over WeChat, a popular application for phones. Detentions for the simple detention of ‘politically sensitive content’ on mobile phones have been increasing in the region. Demonstrations challenging Chinese rule have continued in Tibetan-populated areas of China since widespread protests in 2008. Chinese authorities in Tibet have detained two young Tibetans believed to have transmitted politically sensitive writings and images over the popular WeChat microblog, sources said. Lhundrub, 27, and Rithar, 21, were taken into custody separately on May 22, a Tibetan living in exile told RFA’s Tibetan Service, citing local contacts. 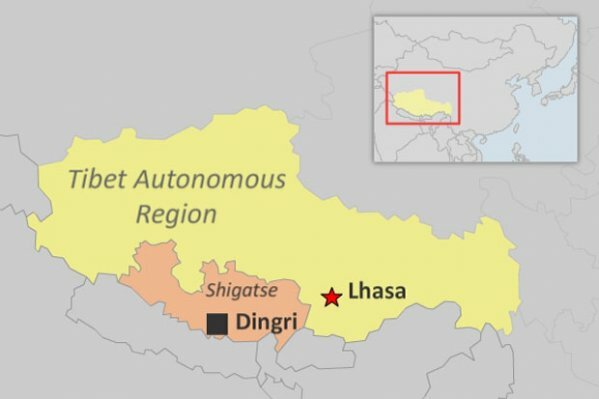 Both were natives of Traktse village in Dingri county in Shigatse (in Chinese, Rikaze) prefecture of the Tibet Autonomous Region, RFA’s source said. “Lhundrub, a monk of the Traktse Chakjomo monastery, was detained in Traktse village, while Rithar was detained in [Tibet’s regional capital] Lhasa,” the source said. “No reason was given for their detention, but local Tibetans believe they had been detected sending politically sensitive writings and photos of the Dalai Lama over their WeChat accounts,” he said. Chinese authorities have stepped up curbs on information flows in Tibetan-populated regions amid protests, in some places including self-immolations, challenging Beijing’s rule in these areas, and images of Tibet’s exiled spiritual leader the Dalai Lama are considered especially sensitive. Separately, a second source confirmed the two had been taken into custody, but gave separate dates for their detention by police, saying that Rithar had been detained on May 16 and Lhundrub on May 19. Another Traktse village resident was detained at the end of last year after police found politically sensitive photos on his cell phone, sources said in earlier reports. Tobgyal, aged about 23, was taken into custody in Lhasa on Dec. 26 while working at a construction site, a local source told RFA. He was handed over to authorities in Dingri on Jan. 12 and released the next day on condition he not travel outside his home area, the source said. Tobgyal’s elder brother Tsewang Dondrub was later detained on Jan. 17, sources said. Sporadic demonstrations challenging Chinese rule have continued in Tibetan-populated areas of China since widespread protests swept the region in 2008, with 140 Tibetans to date setting themselves ablaze to oppose Beijing’s rule and call for the Dalai Lama’s return.